The Phoenix R175 LGR Dehumidifier is a powerful, portable and rugged unit designed for water damage restoration professionals and suitable for a range of other industrial and commercial applications. This is an energy efficient dehumidifier which is capable of removing up to 30% more moisture from the air than other comparable units. The R175 is capable of excellent grain depression and has an impressive operating range. The Phoenix R175 LGR Dehumidifier is a medium to high capacity unit the design of which has been carefully tailored to the needs of the water damage restoration professional. It is engineered for heavy duty operation in demanding and hostile conditions and offers high capacity water extraction in the smallest and most convenient package possible. The R175 is capable of extracting 92 pints of moisture per day at 80°F and 60% relative humidity. These conditions are those laid down by AHAM (Association of Home Appliance Manufacturers) and have been adopted by a large number of companies supplying dehumidifiers to the US market to enable comparison of dehumidifier performance by users. In more extreme conditions the Phoenix R175 LGR Dehumidifier will extract as much as 168 pints (at saturation). The LGR technology incorporated in the Phoenix R175 LGR Dehumidifier enables it to lower specific humidity to levels below 40 grains per pound and is particularly useful where deep drying is required. This process also enable more water to be extracted for a given input of power and the R175 is an energy efficient dehumidifier with a power draw of only 6.3 amps. The temperature operating range of this unit makes it very flexible and suitable for a large range of operating conditions. The R175 is effective at temperatures up to 105°F and an effective auto-defrost function enables the unit to function effectively in low temperature conditions, as low as 33°F. To allow unattended operation the Phoenix R175 LGR Dehumidifier is configured for continuous drainage. It is equipped with a condensate pump which will force the water up to 20 feet above the unit simplifying the problem of finding a suitable drainage outlet. If additional lift is required a second pump will be necessary to relay the condensate to a higher level. The condensate is collected initially in an internal reservoir and purged automatically at four minute intervals. A purge can also be manually selected from the control panel prior to moving the unit to avoid leakage in transit. The functions of the R175 are accessed via a solid state electronic control panel which also contains an hour meter which can report total operating hours and hours per job. Incoming air is filtered by a MERV7 replaceable air filter to protect the unit and improve the air quality in the operating environment. The unit is configured for multiple ducting options with a 12-inch intake duct that can be placed on the lid and a 10-inch supply duct that can be placed on the back of the dehumidifier. A useful feature of the unit is that the warm dry air is expelled from an outlet on the lower front of the dehumidifier, close to the floor where it can best contribute to the drying process. 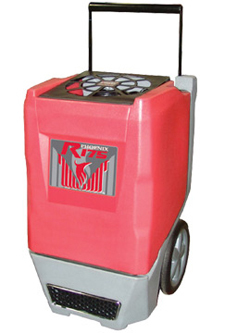 The R175 dehumidifier is a compact unit with a foot-print of 20 x 20 inches and a height of 33.5 inches. A sturdy, retractable handle and two robust rear mounted wheels make the unit easy to manoeuvre on site and for a single operator to load and unload from a vehicle. The unit is enclosed in a tough roto-moulded housing which protects the unit from impact damage and its bevelled corners minimise the risk of damage to objects with which it may come into contact. The housing contributes to the unit's durability which is reflected in the warranty conditions, one year parts and labor, five years on the sealed refrigeration system.